Shukokai “the way for all” was founded by Soke Chojiro Tani (1921-1998). Shukokai is a direct descendant from its parent style, Shito Ryu which was founded by Soke Kenwa Mabuni (1880-1952). Kyo Rei Shukokai Karate was founded in 1993 by Robin Horsfall 6th Dan, and is currently run by his son Alex Horsfall 5th Dan who is the Chief Instructor. Our style of karate "Shukokai do" means "way for all". Shukokai is a traditional Okinowan karate style with the emphasis on self discipline, good manners and respect for others. 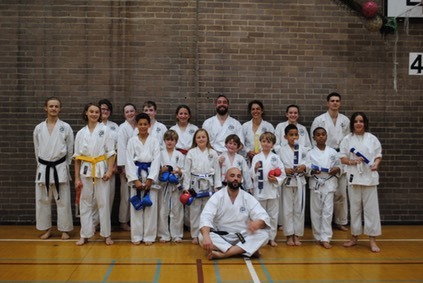 We welcome new students from 4 years old upwards and have many clubs around West London, South West London and North West London to choose from including Putney, Richmond, Chiswick, Twickenham, East Acton, Northwood, Woking, Weybridge, Teddington, Roehampton, Hammersmith, Kingston and Brighton. Thousands of children have trained through our organization over the years. While some have gone on to compete successfully at a National and international level, everyone has taken out something even more important: self-esteem and good attitude.